Attorneys of Jewish youths arrested on vague suspicions of involvement in deadly arson detail how they can't even meet their clients. The lawyers of the Jewish youths who on Thursday were said to have been arrested on suspicions they may have been connected to the lethal Duma arson attack in July are furious over the way the case is being handled. 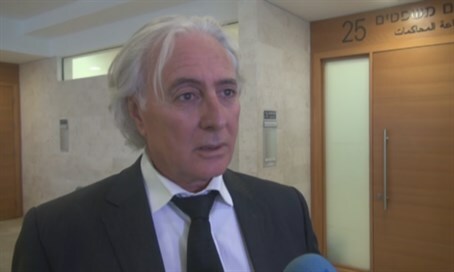 Attorney Tzion Amir, who represents one of the detained minors suspected of involved, described to Arutz Sheva the situation he faces as a lawyer, noting, "you can't meet your client, you don't know what he looks like even." "The legal system has put out a total gag order, with closed doors and no meetings between the defense attorney and the client he represents. I don't know how he looks, I don't know what he did. The police don't present before you what offense is being discussed, what type of offense." "In full seriousness, this is a great harm, a serious harm of indescribable proportions inflicted on the basic legal rights of any detainee. I can't understand it," stated the bewildered lawyer. When faced with requests to meet the clients, "the response of the police is the same thing, 'there are concerns of a disruption in investigative proceedings if the attorney and suspect meet, there are possible concerns that people's lives will be in danger,' etc. These are general claims that we hear." He noted that as a senior lawyer, this is the same tact that the Israel Security Agency (ISA) takes in nearly all such files. "I'm not satisfied with this path. I think it's disproportional and harms the rights of the detainees, even if they are investigated on serious offenses." Questioning whether a meeting between a lawyer and a suspect could disrupt an investigation, he spoke about a possible problematic motivation the police may have in preventing such a meeting. "In the balance between the rights of a suspect and the validity of an investigation there needs to be a break-even point, and the break-even point has to be where you allow the man to see his attorney... to give him legal counsel." "Perhaps it's easier to investigate a suspect when he's isolated, cut off from the world, when he doesn't see an attorney, when he doesn't receive legal counsel, and no one in the world knows where he is at the moment - it may be easier to break the spirit of someone being investigated in such circumstances. That doesn't sound baseless." "They can make people 'disappear'"
Attorney Chai Haber, who represents another suspect, said that "after eight days in which my client is under arrest without seeing his attorney or family, or even a judge, the public was allowed to know that in the state which claims to be democratic, you can in effect make people 'disappear' and no one can inspect the activities of the investigators." "I think that as the picture clears up, it will be possible to understand that the announcement of the investigative authorities about developments in one investigation or another have no connection to reality." On Thursday the gag order was only partially, revealing that the "developments" in an investigation that were recently announced referred to the Duma arson in which an Arab infant and his parents were burned to death, and that the unidentified suspects were Jewish - the father of one of the suspects has already testified that his son and another suspect were in Tzfat (Safed) at the time of the crime. "We can't directly address the suspicions and the evidence that does or does not exist against the suspects," said Attorney Adi Keidar, who represents several of the suspects. "What we can say clearly and precisely, is that during the last week, the state of Israel through all the heads of the law enforcement authorities - the ISA and the police, the attorney's office and the courts - came together as one, and throughout this week there was a breach of the law and a breach of human rights from the highest echelon, and they allowed every dirty trick possible in order to permit this investigation." Keidar emphasized that "the moment the gag order will be completely removed, and it doesn't matter what the investigation results will be, the picture the public will see is a very troubling picture regarding the law enforcement authorities and the legal system." Also representing one of the suspects is Attorney Itamar Ben-Gvir, who likewise argued ISA is infringing his client's rights. "We are gradually becoming like Argentina," he charged. "They won't let me see (my client), they won't bring him to court hearing, they're hiding him in a basement at Shin Bet (ISA) headquarters after beating and attacking him during his detention." The criticism on the state's management of the case echoes condemnation by the Israel Democracy Institute (IDI) on Tuesday against the media gag orders being issued on the case. "Several amendments to the handling of cases of this sort should be conducted," said Dr. Tehila Schwartz Altshuler, head of IDI's Media Reform and Open Government projects. "It is not possible according to the existing law to issue a media gag order about information on security grounds, but rather only on grounds that it can harm an investigation, generally speaking." "The suspicion that arises, at least according to different publications online, is that the system is trying to defend itself due to a failure," charged Schwartz Altshuler. "This is not a media gag order in order to protect an investigation, which apparently - and as cited this morning for example by police chief Bentzi Sau in the media - likely has already ended." Criticism over the handling of case rose after Defense Minister Moshe Ya'alon (Likud) publicly announced in September that the identities of the arsonists were known to Israel. However, just a month later in October, Prime Minister Binyamin Netanyahu admitted the arsonists or proof in the case hadn't been found yet. In the same briefing Netanyahu did not address a question as to why three Jewish youths are still being held in administrative detention, even though no connection has been made between them and the arson. The detainees being held without trial were transferred to solitary confinement, in what is said to be a breach of their administrative detention orders. Some have speculated the investigation is following the wrong lead, given reports and unusual circumstances at the scene of the crime that would indicate the arson may have been an inside job committed by feuding residents of the Arab village. Israel has reportedly left investigation of the Arab village to the Palestinian Authority (PA), instead chasing the "Jewish terrorism" angle based on Hebrew graffiti found at the site.